According to March 7 reports, the Pacifica nation of Kiribati is in talks with Fiji over the purchase of 23 square kilometres of land. There is growing concern that rising sea levels may cause the archipelago to ultimately be completely flooded and rendered inhabitable. 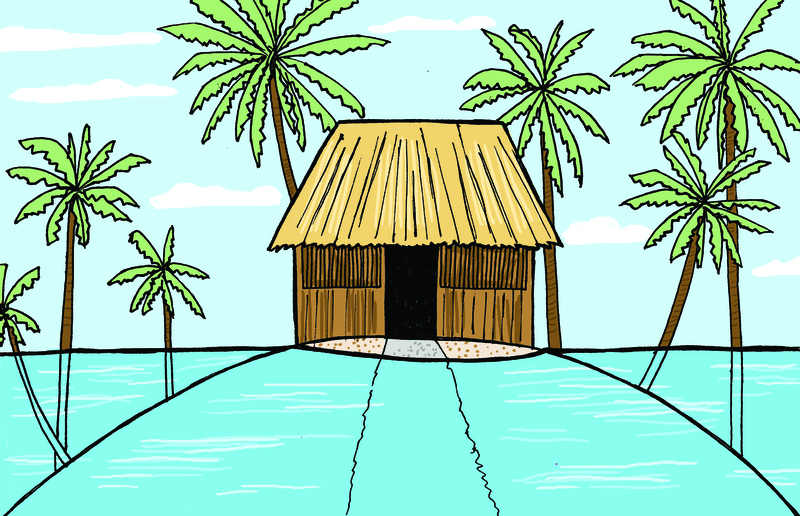 This may make it the “world’s first climate-induced migration in modern times,” writes the Fiji Times. The Republic of Kiribati consists of many small islands located in the Pacific Ocean. Found mid-way between Hawaii and Australia, Kiribati consists of three major island groups: the Gilbert Islands, Line Islands and the Phoenix Islands. The capital city of the Republic is Tarawa, an islet, which houses the majority of its 103,000 inhabitants. The Tarawa atoll played an important role in WWII. “The Bloody Battle of Tarawa” in 1943 led to nearly 8,000 Japanese and American casualties. Kiribati is made up of 32 coral atolls (or coral islands). Created by deposits of lava from a sinking, dormant volcano, the coral atolls provide clear evidence of the rising sea levels, many of them being submerged beneath the waves. Although many atolls in the area remain above the sea level, there have been instances of the rising seawater contaminating the islands’ fresh water supplies, which are vital for the production of crops and trees. Strong rainfall and storm patterns also threaten the country. These issues have furthered worldwide debate over global warming, as well as debate in Kiribati itself. The Kiribati government is considering abandoning the islands. The current plan, which has been endorsed by Kiribati President Anote Tong and his cabinet, has called for the purchase of approximately 2,000 hectares of land from Fiji on the island of Vanua Levu. The fertile land, which is currently owned by a church organization, would be sold for roughly US $9.6 million and would provide the necessary insurance that the republic needs. Although the plan still awaits parliamentary approval, the strategy would be to send a small number of accomplished workers to the area in order to positively contribute to Fiji’s economy and to harvest earth to build up Kirbati’s seawalls. The plan is not to relocate the entire population, although that option is not entirely off the table. President Tong has referred to the relocation project as “the last resort” for the republic. Many villages are already leaving the atolls. This is not the government’s first move to battle the rising sea levels. In September of 2011, President Tong proposed the idea of building a floating island, similar in design to an offshore oil rig. However because of the large price tag of US $2 billion, and the untested concept of building an entire, durable island, the idea was abandoned. The President himself called the concept “something from science fiction.” Building so-called sea walls to protect Kiribati, at a cost of US $1 billion, has also been contemplated. Kiribati is one of the poorest nations in the world — the majority of its foreign reserves came from its past phosphate deposits. Billion dollar projects may not be realistic options. Along with the plan of migration to Fiji, the Kiribati government is also preparing to train and educate its workers in order to assimilate more into the Australian and New Zealand labour markets. While Kiribati may be one of the first nations forced to ponder immediate and extreme proposals to survive climate change, other countries and cities face similar risks. In the city of Dhaka, Bangladesh, coastal flooding has lead to the destruction of crop fields. Migrant farmers cannot earn a proper living farming the saturated fields, forcing thousands of them to move inland to poor neighbourhoods and slums annually.